January 1, 2016 ~ Sara W.
When I was 2, I nearly lost my life to the havoc wreaked on my body from a genetic blood disease. While I was too young to remember the details, the results of that emergency situation were clear from my earliest memories. I had a seven-inch scar that stretched across my stomach where my spleen was removed, and I took a teaspoon of penicillin twice a day to fight off infection until I was 12-years-old. Additional antibiotics were given to me anytime I came down with a cold. Western medicine has been a blessing in my life for as long as I can remember. And its role in my life hardly stopped when I was twelve. I firmly believe my two eldest, who were both preemies, would not be with us today if it were not for Western medicine. I’m a staunch supporter of vaccines. And, the surgeries that helped my daughter’s eyes function properly could not have been obtained through natural remedies. I could go on with countless examples of how Western medicine afforded me a life I would not have had otherwise. That being said, I am finding more and more that natural remedies have a place in achieving optimum health and well-being. For January’s First Friday Find, I felt impressed to share the two natural remedies that have shocked me with their effectiveness in treating common discomforts. Thankfully, I have never suffered from allergies. It wasn’t until I met my husband that I saw firsthand how debilitating it can be when trying to enjoy outdoor activities. He had managed okay while he lived in Texas, but upon moving out to California he soon found himself loading up on Claritin-D or Zyrtec-D, whatever he could get his hands on first, to help him survive outdoors. The allergy medicine helped enough to make a noticeable difference, but when we moved to Oregon, we had a new allergy beast on our hands. Up here, he is allergic to Juniper trees. Juniper trees that are EVERYWHERE! We headed to the pharmacy again, only to find that Claritin-D and Zyrtec-D are not sold over the counter. In Oregon, allergy medicine that has the decongestant portion (-D) requires a prescription. That seemed like such a pain, so it was a blessing when we learned about how local honey can treat allergies. Perhaps not a huge blessing for my husband, as he despises honey, but the effectiveness is worth it. He takes a spoonful of raw local honey everyday and it eliminates his allergy symptoms. When I did a Google search about local honey treating allergies, I was surprised to find the first two sites detailing how it is a myth. If it were a myth, I assure you my husband would gladly omit local honey from his diet. It may be a myth for others, but the fact in our home is that if he skips a few days of local honey, the runny nose and sneezing quickly return. Plus, he is not our only guinea pig for this natural remedy. The way we found out about it in the first place was because a friend of ours shared with us how effective it had been in his battle with allergies. The key is that it HAS to be local. The raw local honey we pick up is taken from a beehive colony about 25 miles away. Where we live, there are a couple of vendors that claim to be selling local honey, but we quickly learned that they were considering anything in Oregon as local. Many of these are taken from Willamette Valley, which is over 100 miles away from where we live. Our alternate guinea pig friend was clear on how ineffective the less-than-local-honey was for his allergies. So, if you are an allergy sufferer and have the ability to get your hands on truly local honey, then I suggest hunting down providers in your area. Again, I did a Google search, this time for fresh pineapple juice as a cough suppressant. And, again, it came up as a myth. Well, sort of myth. One of the sources was Snopes.com, which said that a story, claiming pineapple juice was 500% more effective than cough syrup, was false. According to Snopes, there seemed to be no concrete data supporting this claim. However, it didn’t say that fresh pineapple juice was not effective, just that it was not verified to be 500% more effective than cough syrup. While I also cannot provide research claiming it is 500% more effective than cough syrup, I can tell you that it works 100% with my husband. 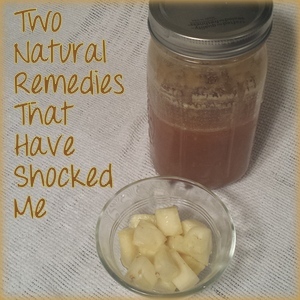 The results of this natural remedy were amazing. My husband only recently came across this tidbit and happened to have a cough at the time. He had coughed all morning and decided to give it a go, as he was chopping up fresh pineapple for us to snack on later. He took a swig of the leftover juice and his coughing subsided almost immediately. He went for hours without a single cough or throat clearing. I suppose you could say it was a fluke that his cough stopped, but the following day provided him with another opportunity to witness its capabilities as a cough suppressant. He went to bed before me that following evening and I heard him repeatedly enduring coughing fits, as I sat downstairs. I finally remembered how effective the fresh pineapple juice had been the previous day. I went to our fridge, pulled out our container of freshly cut pineapple, and poured out the juice that had settled at the bottom. It was probably no more than 5 teaspoons of juice that I collected. I took it up to him, he chugged it back, and not a single cough was had for the rest of the night. It was truly incredible. As I mentioned, I am a huge supporter of Western medicine. But, these two natural remedies that have shocked me have opened my mind to the benefits that can come from pure bits of nature. There may not be concrete studies to support these natural remedies, but these remedies have results that are too tangible to deny in our home. May the ease, affordability, and purity of these remedies find a place in your medicinal arsenal. Cool tip about the pineapple juice…I’ll have to try that.